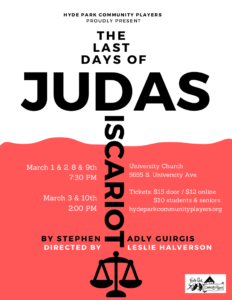 What made you interested in auditioning for The Last Days of Judas Iscariot? I don’t make resolutions, but every year in January, I try to live by a word. My word this year, it’s openness, which includes new experiences. I saw the auditions listed in the Hyde Park Herald. It’s the first I’d heard of the group, and it said ‘No Need To Prepare’ and I thought, why not? It’s the first time I’ve done Community Theater in Chicago. I acted in college and at Theater Works in Colorado Springs, and here’s one in my community. So it sounds like you do maybe more than a little Community Theater? Oh, well I do a lot of public speaking. I did a TEDxUChicago talk, Make The Impossible Possible, about completing an Ironman (2.4 mile swim, 112 mile bike ride, followed by a marathon) You can link it. 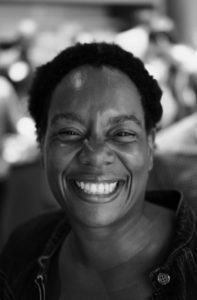 Your character, Loretta, has a long monologue. Does your public speaking help with preparing for that? When I got to the read through, I hadn’t seen the monologue, and I thought ‘oh wow, that’s a lot’. It’s eight and a half minutes, and it comes at the end of the play, so it’s just a little bit of pressure. Leslie encouraged me a lot. Yeah, public speaking helps with that. Have you connected to your character? I think Loretta represents the audience. She found gold, she found the love of her life and then she messed it up. Judas is the technicolor failure, but Loretta is just the black and white personification of human frailty, hoping to be redeemed. That’s all of us. Who hasn’t let someone down? You can look at Judas and maybe call him evil but you can’t say that about Loretta, she just represents a hope of redemption. She’s funny, too. I enjoy her.